SmartProcedures provides powerful capabilities to ensure your workers have the best procedure and work guidance information to do their jobs efficiently and safely. SmartProcedure unique features reduces your procedure administration costs while ensuring commitment to best practices and compliance requirements. Maintain documents, setpoints, global reference objects, etc. The editor is responsible for writing procedures and ensuring that the content is technically accurate and the document is structured in accordance with best practices and writing standards. Writers can edit procedures whose status is NEW and can be assigned writing tasks through the workflow process. Writers can check-in and check-out procedures they are authorized to have access to. When making changes, they will add revision notes and other background information. Operator or user would access procedures from desktops, kiosks or remote field devices, such as IntelaTrac. They would be able to submit change requests, review procedures, take just-in-time training. All data is stored in a mission-critical SQL database to ensure the highest data integrity. The object-oriented database provides high levels of data security and archives all expired procdedures. Provides full circle management from procedure creation to version control to training and usage. Separates content from formatting. Writers no longer waste time with hard-coding paper-based formatting. Advanced analysis based on human error reduction and human factors identifies and reduces procedure errors. Combining automated styles, electronic analysis and templates, SmartProcedures ensures high quality and consistent procedure content. 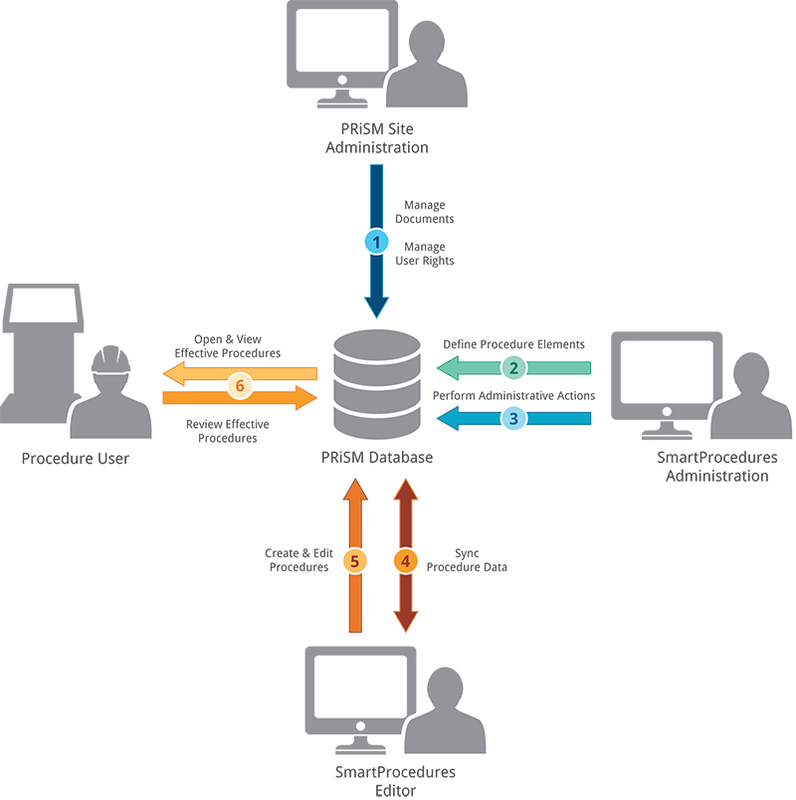 Secure enterprise data security ensures integrity of data and secure access to procedures. Extensive procedure management includes check-in, check-out based on security grants. SmartProcedures can be output to just about any template or device imaginable. 1000s of procedures can instantly adapt to new templates based on procedure properties. Extensive reports available based on procedure metadata or specific user-defined fields. Customized audit reports can be generated in seconds. Global reference objects or equipment can be modified in one place and be updated in 1000s of procedures instantly or be pushed into a management of change review process. SmartProcedure CBT automatically generates procedure content for interactive training, for step-by-step walkthroughs and multimedia reinforcement. System ensures learners review every step, note, warning, caution and attachments.